Two longtime friends share a hunt that was far from easy, but easily memorable. My only objective on Paul’s last morning in Kansas was to help him get a nice buck. Two major highways and several houses surround the small property we were hunting. Paul was sitting about 75 yards away near the preferred bedding area and just in case a buck may have already slipped in, I did a little rattling. If a buck came out, he would give Paul a chip shot. At 7:45 am I hear a "crunch" to my left. I slowly glanced over my shoulder. Just 25 yards away was the big 10-point we had seen earlier in the week. He was headed toward a doe at the edge of a small pond. As the buck walked past I drew on him twice but he never offered a clean shot. I grunted several times but he paid me no mind whatsoever. As a doe walked away I knew the gig was up. I must have hit my grunt tube ten times then doe bleated several times, but neither would respond until I picked up my rack, crashed them and then threw them to the ground. The buck turned around to see what was made the racket, but it wasn’t enough to draw him in. He followed the doe southward. I didn’t quite know what I could do to nudge them north toward Paul. The last time we had seen this deer was a few days ago. He was bedded out in the middle of a milo field. Paul and I had discussed a strategy for bumping the deer. He would give me a hand signal when I walked out of the woods and then head to their likely escape route for me to bump him. Twenty minutes had passed since the deer walked out of sight. I had to make a decision. Either sit it out and see what happens or go signal Paul to get into position for one last push – just like we had discussed. I lowered my bow to the ground. As I took my first step down I saw the doe. She was standing 15 yards away. Now trust me, I knew better than this - but it was Paul’s last day and I wanted him to at least have a shot at this buck. I grabbed my rope and tried to pull up my bow, but it had become stuck on a root!! I’m sure it was at this point when our friend, Tennbow (the late Jeff Coggins), had some influence on the situation. After three hard yanks it popped loose then clanked against my tree steps. I looked at the deer. To my amazement they acted like nothing ever happened! As I was untying the knot, the doe walked through my one and only shooting lane. I quickly knocked an arrow, drew my bow and centered the pin in the opening. The buck walked right in and I hit my release. I didn’t see my arrow hit him but I knew the sound all to well - or at least I thought I did? The buck took a few quick steps then just stood there as if nothing happened. Then I saw his tail twitch from side to side, which I knew meant everything, was ok and I must have missed. …I had no idea what had transpired with Lonny. Frankly, I was getting a little down because this was the last morning of my hunt with Lonny and the outcome was looking bleak. I had a great spot overlooking the milo field where we had seen the big ten point a few days earlier. So I knew the spot was promising. At approximately 8:40 AM, I looked to my left and saw nothing but RACK! The buck had its head down and was walking slowly. In the direction he was headed, he would pass by my best shooting lane - giving me a 10 yard shot. I came to full draw. The buck still had his head down. Just before I had the shot he stopped behind a small tree. For what seemed like an eternity he stood behind that tree. Finally, he started walking again then stepped into my shooting lane. I released. The shot looked a little too far forward, but I knew it was fatal. The buck headed west and then turned north into an old overgrown pasture. I couldn’t control the shaking. The buck was the best I had ever shot. To make this all the sweeter - I had shot him from Tennbow’s tree. I paused for a while to think about our friend Jeff. I know he had a huge smile on his face. I thanked the Lord for giving me this opportunity. I waited 15 minutes before getting down to look for my arrow. I found 8 inches of the fletched end, the rest was still buried somewhere in the buck’s chest. At this point, I walked out to get Lonny and give the buck some more time. Lonny was still in his tree stand, but I could tell something was up. He was as excited as I was. Lonny relayed his story to me – then it was my turn. We looked around for his arrows. We found the first one he shot at the buck. It was covered with blood from tip to tip. The second arrow was clean. As Lonny explained the circumstances, we both began to speculate on what had happened with Lonny’s shot. We assumed that he hit the buck high in the back as it was broadside. From the steep angle that he was shooting, the arrow missed the vitals and hit him in the kidneys. You can see the blood spot just in front of the hindquarters. Lonny figured the buck must have taken a step as he released his arrow. This would explain why the buck was walking toward me slowly with its head to the ground and not pumping blood. The blood trail was difficult to follow through the milo. We found small drops of blood, but nothing indicating a lethal hit. As we were looking, Lonny jumped the buck from its bed. Since he knew the escape route that the buck would take he told me to get the truck and head over to the next road. After about 45 minutes, we began looking for the buck again. Although we eventually picked up the blood trail, it still was not as prominent as we had hoped and it eventually petered out. We picked up the trail a couple of hours later with the help of Lonny’s Dad. We obtained permission to search another piece of private land where we thought the buck might have bedded. We picked up at the last point of blood and began our search. We looked for a solid hour and could not find the buck. At this point, Lonny went with his gut instinct and suggested that the buck traveled north, crossing the dirt road and headed for a stand of hardwoods over in the neighboring pasture. I was beginning to loose hope of recovering the buck and that sick feeling in the pit of my stomach had taken hold. We obtained permission to search the pasture and woods on the property to the north. Lonny split up to look amongst some bails and his Dad and I proceeded to the tree line. We no sooner crested a small rise when I spotted the deer’s rack. It’s hard to describe the relief and pure thrill of seeing that deer. What an incredible sight. That last push was all it took. The deer green scored at 161”. Although we did not have access to a scale, the deer field dressed well over 200 lbs. This is one of my most memorable hunts. I got to share my best kill to date with my great friend Lonny Travis, who graciously allowed me to hunt some prime whitetail real estate. 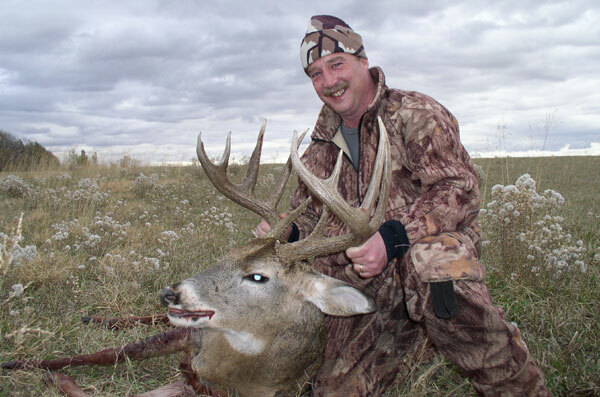 You will have a tough time finding anyone that hunts whitetail deer harder than Lonny. This hunt also brought back fond memories of Jeff Coggins, who was a friend to many Bowsiters. 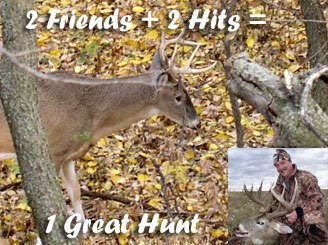 I look forward to future hunts with the good people that I have come to know on Bowsite.com. Travis: In closing I would also like to emphasize how much I enjoyed having Paul come up and share a hunt with me. I have elk hunted with Paul twice in CO and he`s always welcome in my camp. There were a few mornings we didn`t have very good setups and Paul didn`t whine and complain one time. He made the best of it and always maintained a positive attitude, which is a key ingredient to being a successful bowhunter in my opinion. When we found out that we both had put an arrow in the deer, not once did we ever discuss who was going to tag the deer until we decided to leave the buck alone for a couple hours. Our main goal was to recover the deer. I knew who was going to tag the buck, but the main thing is we both have the memory of the hunt to last us a lifetime. Neither of us will ever forget the events of that morning. Should the sun set on the final day of the season and I`m still sitting on my buck tag I will lower my head and thank the good Lord above for another great season of chasing whitetails. I will thank him for all the lessons learned, accomplishments, close calls, the beauty of the seasons and most of all for the memories of the hunt with a good friend I met on the Bowsite.